Downtown Toronto can seem impenetrable with its looming skyscrapers and crowds of well-suited businesspeople, but it doesn’t have to. Get to the heart of it all with this guide and discover all the passion, innovation, and opportunities for fun that fuel the culture of this bustling metropolis. It’s easy to feel lost amid the dazzling high rises of city’s downtown core, especially once you realize seeing the CN Tower on the horizon doesn’t always mean that way is south… Lucky for you, here’s our complete guide to making heads and tails of things to do in Toronto. Get your feet on the ground and soak in the culture of the city’s top attractions, hottest nightlife, and striking performing arts venues – or, keep your head in the clouds with some elevated dining options. Either way, you’re in for a beautiful experience. 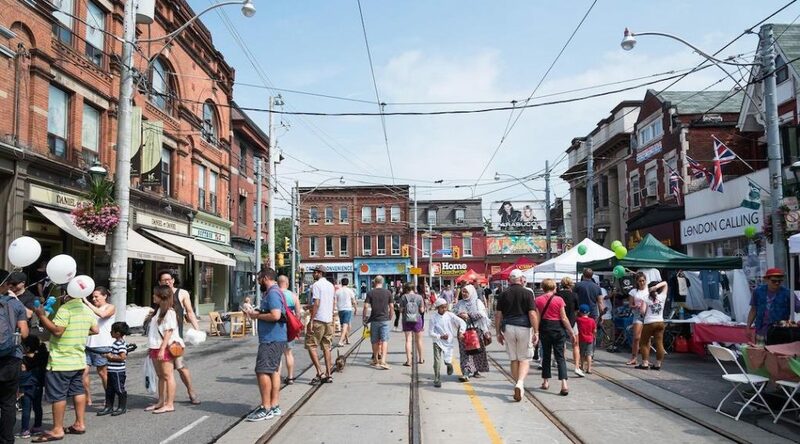 If you want to leave the downtown core and explore off the beaten path, check out Leslieville in the East and Trinity Bellwoods in the West for more alternative ways to get to know the city. Downtown Toronto is ripe with amazing dinner options and fine dining staples such as Canoe. It’s known for its creative Canadian dishes and, located on the 54th floor of the TD Bank tower, it has one of the best views of the city. If you like being high up, we also recommend Kōst on the 44th floor of the Bisha Hotel for breakfast, lunch or dinner. Then, there’s Alo, which was voted Best Restaurant in the country by Canada’s 100 Best for two years now. However, to really make an educated decision about where to dine, check out our guide to downtown’s finest restaurants. If eating isn’t gonna be the main event of your evening and you’re looking for more affordable options, these places blur the line between a takeout counter and a restaurant, just get ready to sit on a stool for the evening. First, Planta Burger is the more casual spin off of trendy vegan restaurant Planta, and makes for a good lunch or early dinner. If you’re staying out later, try WVRST – a beer and cider hall that also has an incredible selection of specialty sausages (including vegan options), the best fries, and even raclette. Wilbur Mexicana, meanwhile, specializes in salsa and has a whole selection, made fresh in house daily, that you can sample with your tacos. Or, for excellent northern Thai fare and cocktails, check out Pai. If craft beer calls your name, you’re in luck with these tap-filled spaces. First off, there’s Bar Hop. That’s the name of a bar, but the activity’s not a bad idea either… At Bar Hop you’ll find an impressive 36 craft beers on tap, as well as over 100 bottles that include special and private imports. It’s a cozy, approachable place, and the kitchen’s open until 1am, too! Meanwhile, King Taps is an urban sports bar with elevated food, including amazing pizza, in the heart of the financial district. There, you’ll find over 50 beers on tap and a spectacular patio, all spread out over 2 impressive floors. If you’re trying to get away from it all, without straying far, try the recently opened Goldie. It’s a two-story cocktail bar and lounge located in a converted townhouse. It has a menu of refined tapas and draws its inspiration from the 70s and 80s. Touches like wood panelled walls give the whole space an intimate feel. Then, on the other end of the spectrum is the unpretentious yet legendary Horseshoe Tavern. You’ll find a relaxed atmosphere, a pool table, and a back room music venue that features both local and touring musicians, brining the underground right to the heart of the city. Downtown Toronto is home to a couple of bars that have made it onto Canada’s 100 Best list of the 50 Best Bars, so you can count on the fact that they have a stamp of approval from industry experts. First there’s Rush Lane & Co. at #28. They take mixology seriously, making creative and meticulously crafted cocktails. They even test the pH levels of their citrus juice in their lab to ensure the right consistency. Then, rounding the list out at #40 is BarChef just across the street. This dimly lit, intimate space also specializes in lavish cocktails, served in vintage glassware. They have a stunning amount of homemade bitters lining the shelves to make their modernist takes on what drinks can be. The food and even drink plating looks like a Japanese zen garden, serving up both elegance and taste in everything they do. Toronto has a rich, exciting and diverse theatre industry featuring everything from Broadway shows like “The Phantom of the Opera” and “Wicked”, to more funny shows like “Dee Snider’s Rock & Roll Christmas Tale,” a rock opera for the holiday season created by and starring the Twisted Sister lead singer. Mirvish is the big player on the scene – it’s a theatre production company that owns and operates the stunning Royal Alexandra, Princess of Wales, Ed Mirvish and CAA theatres, all in downtown. You’ll also find some hilarious drag at Ross Petty’s family-friendly comedies, such as Peter Pan, which show at the Elgin and Winter Garden Theatre Centre. For complete theatre listings and tickets visit the independently run Toronto Theatre guide. Your experience of downtown Toronto doesn’t need to be all glass and skyscrapers – the district also includes several smaller communities that are closer to the ground and incredibly pedestrian friendly. To soak in a whole lot of culture, spend a day exploring the shops of bustling Kensington Market and Chinatown, travel back in time on a visit to the Distillery District, or discover the residential haven of Cabbagetown. They’re all a decently short walk from even the deepest part of Toronto’s concrete jungle. These bars are the perfect places to look out from as you get your party on. For a coveted view of the water, The Goodman Pub and Kitchen is your go-to. With its huge waterfront patio, mix of contemporary and traditional pub food and extensive list of beers, this place is fun, friendly, accessible and picturesque. Similarly, it isn’t too glamorous, but The Porch is a rooftop classic – the whole bar is just a big patio. You’re sure to find all the trendy young adults in the city taking photos with the skyline as a backdrop along with their drinks, served in fun plastic buckets. But if buckets aren’t your thing they also do weekend brunch! And if you’re more into history, check out the Royal Ontario Museum up at Bloor Street. It also features a striking glass addition to its original architecture and has dinosaur bones on display, among other natural and cultural treasures. Right next to The Harbourfront Centre (just across some fun, wavy boardwalks) you’ll find little HTO Park with its grassy hills and a sandbox style beach. There’s no swimming allowed, but there are plenty of yellow umbrellas to relax under. It’s the perfect spot for spending an easy summer day by the water. Similarly, there’s Sugar Beach. It’ closer to the east end of things (at Lower Jarvis) and spotted with cotton candy pink umbrellas. The trail is actually a series of bike paths (or rollerblade paths if that’s your thing) that stretches along the whole waterfront of Toronto, making for some spectacularly scenic cycling. Just look for the distinct green and blue lines down the centre. For a serious ride use Sugar Beach as a starting point – although the path does continue a bit farther east to Cherry Beach, too – and head west for about half an hour. You’ll be able to easily cross downtown. On the way, you’ll also traverse some lush parks and wind up at the scenic Sheldon Lookout, located at the mouth of the Humber River. On the other hand, if you’re gonna want to dance or really let loose on a night out, the King Street West area is the place for you. It’s the main avenue for the club scene in Toronto, as it passes through both the Fashion and Entertainment Districts. The stretch is home to local party favourites such as Uniun Nightclub on Adelaide, which is practically a Toronto institution with its stylish industrial decor and state-of-the-art sound and LED lighting systems. You’ll also find hot spots like sophisticated Orchid Nightclub, or art-based club/lounge Everleigh. Toronto’s home to some pretty cool sports teams. First off there’s the Raptors. They have the tall order of representing the whole in the NBA since they’re the only Canadian team, but they do pretty will with their iconic slogan “We The North,” which has recently been usurped by “North Over Everything.” When they’re in the off season for winter, the Maple Leafs take over their Air Canada Centre home (soon to be called the Scotiabank Arena) and turn it into an ice rink. Now, the Leafs are not exactly known for winning… but we love them anyway. Meanwhile, over at the Rogers Centre, originally named the SkyDome for its retractable roof, you’ll find the Blue Jays pitching some real competition in the world of baseball. The Four Seasons Centre for the Performing Arts was specifically designed to be the home of the Canadian Opera Company and the performance venue for The National Ballet of Canada. It integrates these traditional performing arts into the fabric of the city with its stunning glass facade. While opera may sound like it’s for old people, the COC puts on contemporary and engaging performances such as La Bohème, a story that’s sure to tug at your heart strings about young free spirits in 19th century Paris navigating love, poverty and loss. For ballet, you’ll find a range of work including Physical Thinking, which shows examples from William Forsythe’s provocative ‘anti-ballet’ oeuvre, as well as beautifully done renditions of classic stories from A Midsummer Night’s Dream, to Alice in Wonderland and the annual holiday classic, The Nutcracker.